"Burnt Bridge Creek, Clark County, Washington"
Click image to enlarge Burnt Bridge Creek drainage, Vancouver, Washington. View looking east from Fruit Valley Road near the mouth of Burnt Bridge Creek. Image taken, September 3, 2018. Burnt Bridge Creek runs parallel to the Columbia River, and merges into Vancouver Lake on its east side. Four miles to the north lies Salmon Creek. 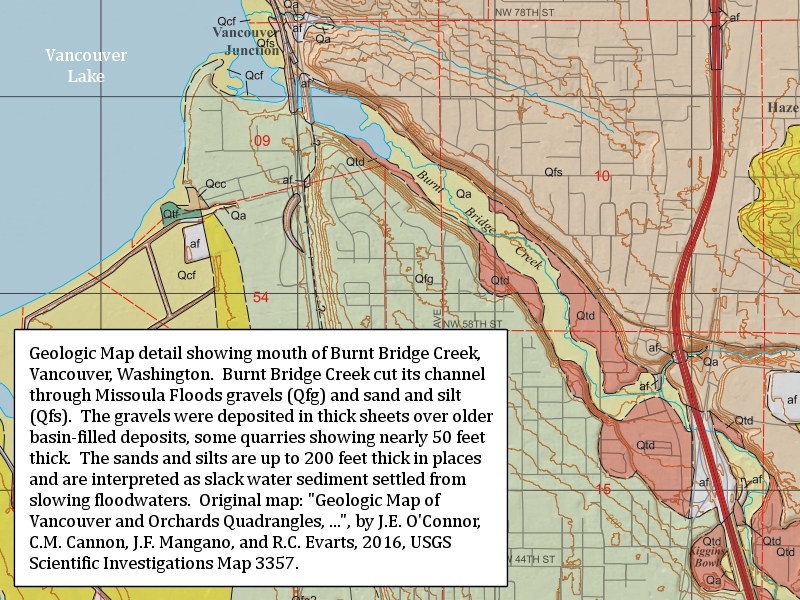 Thousands of years ago the Missoula Floods deposted tons of sand and gravel through which both Burnt Bridge Creek and Salmon Creek carved their channels. The name of Burnt Bridge Creek comes from a little wooden bridge which first spanned the creek. According to the Clark County Water Resources ("Burnt Bridge Creek Watershed", 2004), the Burnt Bridge Creek watershed is comprised of 28 square miles of mostly flat to somewhat hilly land. Burnt Bridge Creek originates in field ditches that drain a large wetland area between NE 112th Avenue and NE 164th Avenue, then flows through another large drained wetland between NE 86th Avenue and NE 18th Street. For its first eight miles, the creek channel alternates between ditches and natural channels. 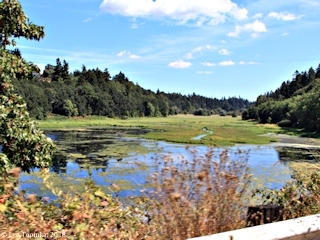 For its last five miles, it flows through a small canyon with a narrow flood plain before reaching Vancouver Lake, where it enters the lake on its southeast corner. Burnt Bridge Creek has few visible tributaries. Cold Creek, the largest tribuatry, drains the area north of Minnehaha Street while Peterson Ditch and Burton Channel drain from near Interstate 205 west to Burnt Bridge Creek. Another very small creek flows west from springs at Bagley Park to Burnt Bridge Creek. About 2/3 of the watershed is in the city of Vancouver. 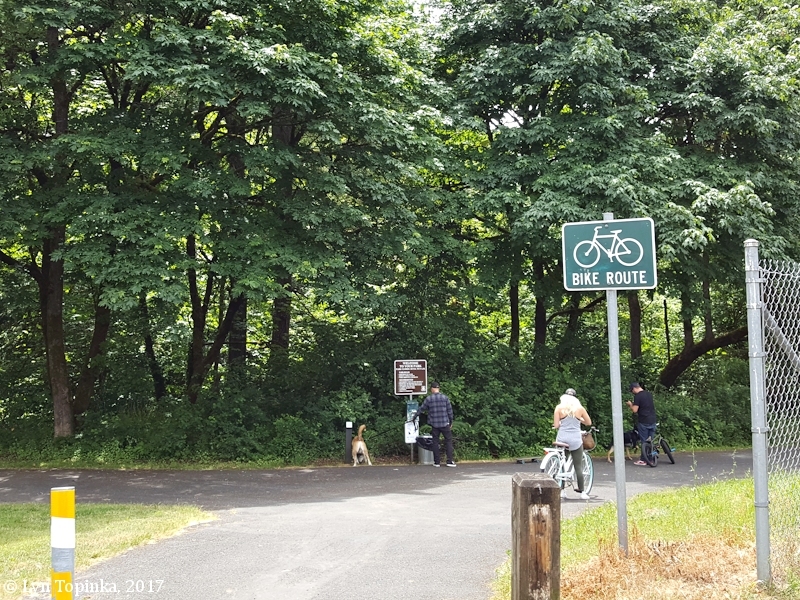 Over the years the City of Vancouver along with Clark County have created a greenway corridor and park system along the creek, with a goal of creating an eight-mile trail system between Vancouver Lake and Interstate 205. Today's Burnt Bridge Creek separated Fort Vancouver from pastures and areas known as the "Back Plains". Initially called "Bridge Creek", it later became "Burnt Bridge Creek" after the first wooden bridge was destroyed. Since Hudson's Bay Company times, the creek has been known as "Bridge Creek", "Burntbridge Creek", "Stenegier's Creek", "Marble Creek", and "Burnt Bridge Creek". In 1897 the U.S. Board of Geographic Names made "Burntbridge Creek" the official name of the creek. In 1970, the U.S. Board of Geographic Names revised their 1897 decision and made "Burnt Bridge Creek" the official name. "Burnt Bridge Creek: "A creek of many names. At one time, when a bridge crossed the creek at 4th Plain, it was called Bridge Creek. Then the bridge burned. In the 1850s, it was also called Stenegier’s Creek, after a Hudson’s Bay employee on whose land the creek ran. In 1865, it appears on the maps as Marble Creek, for Ansil Marble, on whose land it then lay. However, by 1885, it appears as Burnt Bridge Creek. The stream was Vancouver’s primary water source until the city’s wells were dug." These plains were connected by a road which extended from Upper Mill Road northeast of the stockade through the forest and plains. To reach the Back Plains it was necessary to ford what is now known as Burntbridge Creek, where, by 1844, a bridge had been built." Source: Fort Vancouver Cultural Landscape Report, 1992, Chapter 2, Volume 2. "In regard to the creek north of Vancouver barracks, known as Marble or Burntbridge creek, concerning the true name of which inquiry was received from Marcus Barker, secretary of the United States board of geogrpqahical names, the following facts are furnished by T.A. Wood: A bridge was built across this creek by the Hudson's Bay Company in 1836, when the country around was covered with primeval forest. The creek was then known as Bridge creek. In 1840 a great fire swept over that section, consuming the forest and the bridge, leaving northing but blackened stumps. The creek after that was called Burntbridge creek. Some distance down the creek a man named Marble took up a donation land claim and built a mill. This was known as Marble's mill, and this section was known as Marble's, and the creek in that vicinity was called Marble creek. The original name of the creek was Bridge creek; but, after the fire and the burning of the bridge, this was changed to Burntbridge creek, which has since continued to be its designation. The most natural thing imaginable in connection with the creek is the bridge; but in the early days of the footlog and the trail, bridges were not so common as now, and the fact that a bridge was built across this creek by the Hudson's Bay Company made it notorious, and entitled it to the name of Bridge creek, to distinguish it from the scores of other creeks in that section which had no bridges. To name a creek Bridge creek now would be about on par with naming it Water creek." Source: "Burntbridge Creek", IN: "Oregon Native Son", October 1900, Oregon Native Son Publishing, Portland, Oregon. In 1853 Captain George McClellan followed the Klickitat Trail, mapping the route passing between the Hudson Bay Company's "Back Plains". Within the first two miles the troups crossed "a brook twenty feet wide". Burnt Bridge Creek carved its channel into Missoula Flood deposits. 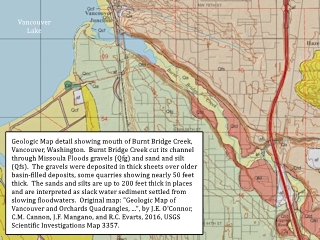 Click image to enlarge Geologic Map detail, mouth of Burnt Bridge Creek, Vancouver, Washington. Original map: J.E. O'Connor, U.S. Geologic Survey Scientific Investigations Map 3357. The Vancouver to Orchards to Sifton streetcar line, or "electric trolley", was a line which ran from downtown Vancouver north, and then east to the small communities of Orchards and Sifton. The streetcar's "car barn" was located at 33rd and St. Johns where the eastern portion of the line headed east on 33rd, crossing Burnt Bridge Creek, Falk Road, Stapleton Road, and then heading northeast, parallelling the north side of Fourth Plain through Orchards Park and ending in. Today's State Route 500 generally follows the same path. 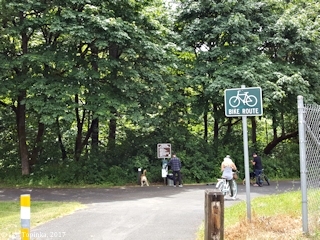 Click image to enlarge Bike path to Burnt Bridge Creek, east side of Burnt Bridge Creek at Nicholson Road dead end, Vancouver, Washington. Image taken June 4, 2017.